Nothing will teach you the importance of a good skincare routine like the rebellion of skin that's accustomed to being taken care of. My skincare regimen hasn't been my top priority these days (I blame it all on the responsibility that is moving into a new house), and it's started to show. After discovering a few deep and cystic zits on my chin, I realized that it had been close to a couple months since I had exfoliated - something that my skin (and probably yours too, whether you know it or not) thrives on. So, I resurrected my Arcona Cranberry Gommage from some box and squeezed out the last dying drops. And, I'll tell you honestly, my skin immediately felt the difference. Here's what my skin loves right now. 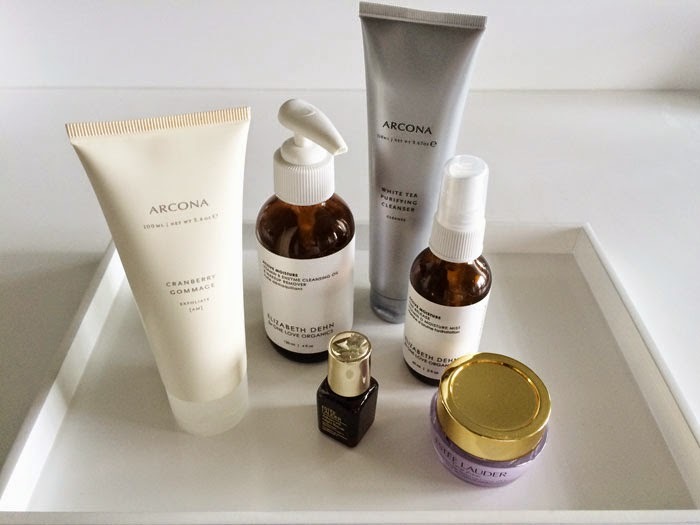 Arcona White Tea Purifying Cleanser - This gel cleanser is kind of the bomb. A teensy bit goes a really long way to make your skin feel clean without over-drying it. I've only been using it about a week now, but I like it. And though I haven't tried it yet, I imagine that it'd be amazing to use with a Clarisonic because it gets nice and bubbly as you add a little water. One Love Organics Vitamin B Enzyme Cleansing Oil - Yes, I said cleansing oil. Put in on dry skin and then rinse. I discovered this stuff in the winter, and it has been ideal for giving my skin the extra hydration it needs. Because it's dry year-round in Utah, I'll continue to use it and probably alternate with the Arcona cleanser as needed. Arcona Cranberry Gommage - Like I said above: My skin really notices when my routine is lacking this essential element. Plus, this stuff smells yummy enough to eat. (But don't, OK?) Scrubbing away dead skin cells on a weekly basis keeps your pores much clearer and leaves your skin feeling tighter and glowing. Trust me on this one if you don't trust me on anything else. Exfoliate. One Love Organics Vitamin D Moisture Mist - It's a great refresher when you mist it on your face the second you step out of the shower, and it gives your skin those extra vitamins it might be craving. Estee Lauder Advanced Night Repair - This is another product I went a while without using and noticed a difference the second I started up again. For me, it helps even out my skintone and makes any fine lines around my eyes and mouth look less prominent. Estee Lauder Advanced Time Zone - I don't think I've ever met an Estee Lauder moisturizer I didn't like, and I've tried almost all of them. There are different formulas for different skin concerns (visit your local Estee Lauder counter to find the best for your skin type), and this one is working great for me right now. It applies evenly, gives a great amount of moisture without being even the least bit greasy. And best of all, it doesn't flake off when you apply your makeup.